The 21 cm Line: Why Observe It? I talked in an earlier post about what the 21 cm line is but you might be wondering why we are interested in observing this line. Why spend so much time on a survey focused on detecting this transition line? One of the main reasons is that it allows a different method of selecting galaxies. To date, most large surveys have been optical (or near infrared) surveys. This means that galaxies are identified based on the stars contained within them that shine at optical wavelengths. With ALFALFA, we are instead looking for galaxies based on their 21 cm line emission, which is a transition line of neutral hydrogen. 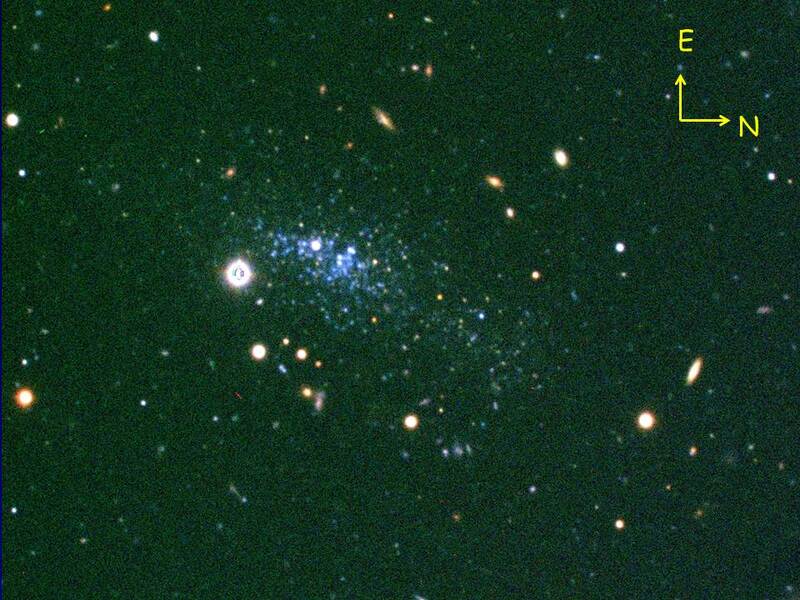 So we are identifying galaxies based on their gas, rather than stellar, content. As a result, ALFALFA is able to easily find galaxies that don’t have a lot of stars (low surface brightness galaxies) but that have lots of gas; these are the types of galaxies that are often overlooked by optical surveys. Of course, ALFALFA misses galaxies that have no gas and lots of stars (such as ellipticals) that are detected in optical surveys, so you want surveys at all different wavelengths. Observing the 21 cm line offers a few other advantages that are worth mentioning. If you know the total flux of radiation from the 21 cm line at your telescope and the distance to a galaxy, you can compute exactly the mass of neutral hydrogen in that galaxy. This gas mass can then be used to compare properties across different galaxies and look for correlations. One of the other major advantages is that due to how radio telescopes receive radiation, when observing a source you obtain spectral information naturally. By spectral information, I am referring to the fact that you record the flux as a function of frequency (or velocity from the Doppler Effect). You can see this below with data from an example galaxy – a classic double-horned HI (neutral hydrogen) line profile. The total flux of the galaxy comes from calculating the area underneath the peak. There’s also other information available here, though. The center of the profile gives the redshift, or recessional velocity, of the galaxy which can be used to estimate a distance. The width of the profile corresponds to the rotational velocity of the galaxy (with an inclination factor). The beauty of 21 cm observations is that we record all this data at once. If you wanted to do the same optically, you would first need to find a galaxy in a photometric survey (essentially, take a picture of it with a telescope) and then target it a second time for spectroscopic follow-up to find a redshift for the galaxy. Of course, optical surveys have their advantages too. The ALFALFA Survey is trying to detect galaxies through emission at the ’21cm line’. In fact, you’ll see mention of the 21cm line throughout extragalactic radio astronomy as it is one the most common observations. This might lead you to wonder: What is the 21cm line? And why do we want to observe it? For now, I’ll address the first of those questions; you’ll learn all about why the 21cm line is interesting in a later post. Alternately, this post could be titled: “A Quick and Dirty Introduction to the Hydrogen Atom”. The ’21cm line’ is a specific transition in the hydrogen atom, so called because the energy of the transition corresponds to a photon with a wavelength of 21 cm. Physicists love hydrogen because it’s the simplest atom – one proton and one electron – meaning it can be solved exactly. Astronomers love hydrogen because it fills the universe and observing it in different states offers lots of information about conditions found in astronomical situations. Most people are familiar with the simple Bohr model of the atom where electrons orbit the nucleus in quantized orbits. Of course, like many physics explanations, the Bohr model isn’t accurate but it does provide a convenient picture for much of the physics so we continue to use it. The transitions in atoms that most people are familiar with are electronic transitions. The orbits of electrons in an atom have quantized energy states and there is a specific energy associated with a move from one orbit to another. For hydrogen, these electronic transitions have energies that release photons in the ultraviolet, optical and infrared parts of spectra. The energies associated with the 21 cm line are much, much lower. In order to understand where the 21cm line comes from we have to look further at the structure of hydrogen. The first set of corrections made are termed “fine structure” and account for the fact that the base calculation ignores relativistic effects. These aren’t the corrections that cause the 21 cm line, though. For that we need to go to a second set of corrections (which have an even smaller change in energy levels) – the “hyperfine structure” of hydrogen. The hyperfine structure refers to the weak interaction between the spins of the proton and electron. Spin is an extremely quantum idea and hard to describe with a classical analogy. The best way to think of it is as particles spinning on their own axis – it behaves as an angular momentum term in many ways. However, it does have some odd properties, which we will ignore for now. If you keep the simple picture of a charged particle spinning in mind, you can imagine a slight magnetic field resulting as moving charges cause magnetic fields. Similarly, the proton creates a slight magnetic field. The interaction of these two magnetic fields results in the 21 cm transition. The electron and proton can both be thought of as magnetic dipoles generating magnetic fields. There is then an energy difference between when the dipole moments of the electron and proton are aligned or anti-aligned. The state where the two spins (or magnetic moments) are anti-aligned is a lower energy state; when the atom transitions from a “spin-up” electron to a “spin-down” electron, a photon with a wavelength of 21 cm (corresponding to the energy difference between the levels) is released. I’m going to try ending posts with the math so that it’s available if you’re interested and easy to skip if you’re not – hopefully everything I write will be clear without any equations. The energy of a photon is related to its frequency by where is the frequency and is Planck’s constant. If you would like to know the wavelength of this photon, you can find it from the speed of light: where is the wavelength. where is the Bohr radius of an atom and are the magnetic moments of the electron and proton, respectively. where is the degeneracy of the proton ( ~2.79), are the masses of the electron and proton, respectively, is the fine structure constant (~1/137), and is the charge of the electron.